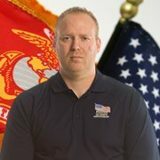 Marine Corporal Travis Greene was on his third deployment when he lost both of his legs in an improvised explosive device (IED) blast in Ramadi, Iraq on Dec. 7, 2005, the 64th anniversary of the attack on Pearl Harbor. While assisting with the medevac of an injured Marine from an IED blast that hit a seven ton truck, Cpl Greene and his teammates were beside the vehicle with a stretcher when another bomb detonated next to the vehicle. The truck blocked the upper bodies of those in the area however it funneled all of the shrapnel directly toward their legs, causing traumatic amputations to five of the Marines, including Cpl Green. Transported by HMMWV to the Ramadi Medical Facility, Cpl. Greene was airlifted to Baghdad and Balad before being transported to Landstuhl, Germany, and finally to Bethesda Naval Medical Center where he awoke seven days after the blast. Spending fifty-three days in the ICU, Travis endured multiple surgeries and complications. Transferred to Walter Reed Army Medical Center, he spent eight months in treatments and therapies before being sent to Balboa Naval Medical Center bringing his total time spent hospitalized to more than one year and eight months.